Led by Greenlight marketing coordinator Stephanie, our young readers book group in PLG is geared toward kids ages 9 to 12, and reads great contemporary and classic chapter books. Parents are welcome (but not required) to attend, and pizza is served. 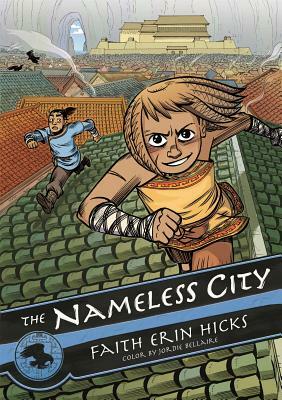 For September, the group discusses The Nameless City by Eisner Award-winning graphic novelist Faith Erin Hicks. Every nation that invades the City gives it a new name. But before long, new invaders arrive and the City changes hands once again. The natives don't let themselves get caught up in the unending wars. To them, their home is the Nameless City, and those who try to name it are forever outsiders. Kaidu is one such outsider. He's a Dao born and bred--a member of the latest occupying nation. Rat is a native of the Nameless City. At first, she hates Kai for everything he stands for, but his love of his new home may be the one thing that can bring these two unlikely friends together. Let's hope so, because the fate of the Nameless City rests in their hands.